Downie Dee Maccallum, wanted for possession of stolen property on a B.C.-wide warrant, is shown in an RCMP handout photo. Mounties in Chilliwack have issued a British Columbia-wide warrant for a 33-year-old Chilliwack woman wanted for possession of stolen property. 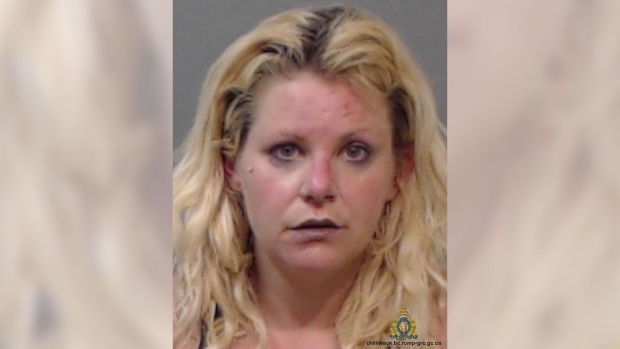 Downie Dee Maccallum was previously arrested on April 1 in Chilliwack, when officers found her and two other people inside a reportedly stolen vehicle. According to court records, the 33-year-old was charged with possession of stolen property under $5,000. Those court records also show she was released on $500 bail after a scheduled court appearance on April 9. The RCMP are urging the public not to try to apprehend Maccallum if she’s spotted. She’s described as white, stands roughly 5'5" tall, with blue eyes and dyed-blonde hair. Anyone with information about her whereabouts should contact Chilliwack RCMP at 604-792-4611, or call Crime Stoppers anonymously.